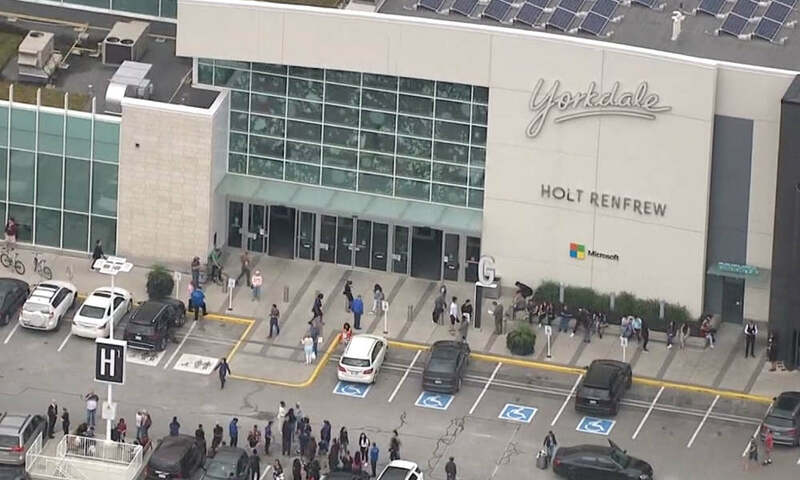 Police and other emergency services were called to reports of shots being fired at the Yorkdale Mall in Toronto, but no one was injured, local officials say. At least two suspects are being sought. The incident began just before 3 p.m. ET on Thursday when police were called to reports of shots being fired at the mall. A short time later, officers confirmed that a shooting had taken place at the mall and the complex was evacuated. The Toronto Police Service said in a brief statement that no injuries have been reported. Details about what happened were not immediately released, but police are looking for two male suspects in connection with the shooting. The first suspect is described as a skinny mixed-race male in his 20s with a black handgun, standing 5 feet 9 inches tall. The second suspect is a black male in his 20s who was last seen wearing a black hoodie and blue jeans. The Yorkdale Shopping Centre, which is located near downtown Toronto, is the busiest mall in Canada with 18 million visitors a year. It is home to more than 270 stores and services, making it one of the biggest malls in the country.